In the last two weeks we have shared some of the experiences we have had here in the Wyoming Mormon Trail Mission. There is no other mission like this on planet earth. We had told you about the miles of trekking we have done with the youth and the spiritual experiences we have had hosting the Martin’s Cove Visitor’s Center. In this final post let us tell you about another aspect of this mission that makes it so fun and challenging. This is a working mission— as in the missionaries do ALL the work. There is rarely a need for paid contractors when there is so much skill already here. Retired plumbers, electricians, wood workers, ranchers, heavy equipment operators, carpenters, cowboys, machinists, general contractors, internet gurus, yard maintenance experts– you name it, there is a missionary who knows how to do it. Clay and I didn’t come with most of these skills, but we sure had fun learning some along the way! Clay helping rebuild the stone steps for the baptismal area in the Sweetwater River. Road Crew— replacing gravel, cleaning pot holes, laying asphalt. Yard Work— mowing, watering/weeding flower beds, tree trimming, miles of weed-eating. Ranch Hand— painting buildings and log benches, water pump repair, handcart sanding/staining/wrangling– I bet you’ve never wrangled a handcart before! But, any assignment that starts with the phrase, “You need to drive a Rover and….” is a great job! Olive Garden— I wish we were talking about the yummy food (the closest restaurants are 60 miles away), but it actually refers to a request by the State of Wyoming that we remove all of the wicked, thorn-covered Russian Olive trees infesting the property. A tough, prickly, pokey, nasty job. The Church raises cattle on this ranch, and sometimes a calf is abandoned or its mother dies. So, we serve as cow mamas and daddies– making the warm cow milk formula and feeding the babies 1/2 gallon morning and night until they are weaned. Luckily, the feeding pen is also at our RV camping site, so we don’t have to go hunt them down on the 100,000 acre property. Rah-Rah— not a chant at a homecoming game– it stands for RRA: Rest Room Assistant. Cleaning all the toilets (about 56 of them) and taking out the trash on the entire campus. It’s actually not a bad job. We enjoyed starting early when assigned to Rah-Rah. We were on the trail at 5 am one morning, greeted by the yipping of coyotes as the sun came up. Now that’s a nice day at the office. Lady Bug Rover for cleaning restrooms- but not in fancy trail dress! Medallions— Yes, I learned to crochet. These are souvenirs we give visiting youngsters. Snake Wrangling— most of the snakes are bull snakes- big but harmless constrictors that just need to be relocated when they wander too close to to the Visitor’s Center. We tell the visitors not to bother the snakes, but one trek group’s leader wanted to pick up a bull snake and put it over his shoulders for a photo op. The snake started puking- and threw up a prairie dog. Then he puked up another one, and another one, until there were 6 dead prairie dogs on the ground. The leader put the snake down and it still had another critter inside him. I saw the picture of the coiled snake, with dead prey all around it. When the trekkers got back from their days hike, the snake (and its snacks) were gone. Occasionally, there are pesky rattlesnakes that make a nuisance of themselves, so some of the guys are experts at making them disappear before they harm us, a tent camping guest or a toddler wandering around on the inviting green grass. Rattlesnake hatbands are a popular accessory among our missionaries. Life gets interesting on the open plains of Wyoming. There have been some close calls, but no one has been bitten yet. Clay and I did have to do some real bull wrangling to get them out of one of the remote campgrounds at Rock Creek Hollow before the trekkers arrived. That was exciting and bit nerve-wracking. Especially when they kept coming back. Lumberjacks– We do our own fencing using lodge pole pine. We get the poles by traveling up into the Green Mountains with our logging permit and cutting down the trees. It’s a great adventure– two mission 4×4 heavy duty trucks, a flat bed trailer, 10 loggers and a picnic lunch. We ventured into the Green Mountains in Mid-October and found freezing temperatures with bitter cold winds, the frost covered the trees and sage brush like a silver white frosting. Snow clung to the shady spots and the crisp smell of pine filled the air. The one lane rocky, eroded, bumpy road down the side of the mountain to the designated cutting area had great views out over the distant mountains across the valley below. Two chain saw lumberjacks got to work harvesting the 90 trees and lots of jack rabbits carried the cut 16-foot poles up the steep hill, tromping through icy snow patches and muddy spots. Wendy and Clay taking a breather. Air is thinner at 8800 feet! We ate our lunches on a fallen log while being warmed by the lovely fire. Then the poles were loaded in the back of the pick up truck and schlepped up to the flat bed trailer on the top of the mountain. After several trips, the job was done. It was hard work and a lot of fun! Our very favorite trekkers were from Wisconsin: our son, Jesse, his wife Terri and the kiddos Eric (6) and Hazel (4). I made pioneer outfits for them and we had a wonderful week sharing the beauties of Wyoming and pioneer stories from our family history. Now those are some sweet pioneers! Short term attempt at helping pull a handcart. Hazel decided she didn’t want her picture taken. Bonnets are good for that. Our family trek, Blue Flag, crossing the Sweetwater River. Riding in a handcart is a lot more fun, when Dad and Grandpa are pulling it! So, if you happen to be in central Wyoming (between Casper and Muddy Gap on state highway 220), stop by and see the Martin’s Cove Mormon Handcart Historic Site. Or come serve a mission here. They always need more adventurers! There is never a dull moment on the Wyoming Mormon Trail Mission. When we are not serving at the Visitor’s Center, leading tours of the historic Sun Ranch buildings, trekking with groups through Martin’s Cove or re-enacting stories from the lives of the pioneers, we get to do other interesting assignments. As you approach the homestead, you see the welcome post greeters, a day long assignment to get visitors and hundreds of trekkers where they need to go. Trek groups come from states such as California, New Mexico, Idaho, Utah, Colorado, Montana and Wyoming. Chinese tour buses traveling around the United States purposefully stop at our site on the way to Mount Rushmore in South Dakota because we have super clean restrooms. They walk through the visitor’s center and snap a ton of pictures, especially if a missionary is wrangling a snake off the lawn. Welcome Post can be relaxing, with enough time to read a book, or it can be very busy. On the last day of trekking in September, we counted 450 visitors in 120 vehicles. During the height of the summer trek season, the numbers soar. We really do park handcarts as the trekkers come from the homestead part way along their journey into Martin’s Cove. There were about 600 trekkers pulling 45 carts in 3 groups while we were hosting one day. Parking can get tight! Using colored flags to distinguish between the treks, Base (which acts like an air traffic controller) knows where each group is at all times as we take our trek groups from place to place. Constant radio communication with base keeps each trek group from running into each other so that each can have a great experience. The trekkers are then ready to quietly walk up into Martin’s Cove for more spiritual experiences. When trekkers get off the buses, they load handcarts with 5 gallon buckets containing their personal belongings and walk 3 miles from the homestead to Cherry Creek Campground, where a missionary couple greets them, directs traffic and gets all the different groups and their myriad of support vehicles situated for the night. After dinner, the groups learn square dancing (with missionary assistance) and have fireside talks as the sun sets. After doing ‘Oh Johhny Oh’ square dancing, the tune sticks in your head all night long as you try to sleep. Trekkers water-coloring pictures of handcart pioneers and their rescuers. It’s a long, hot, windy time during that week of campground hosting, but it’s also fun mingling with sweet and enthusiastic young trekkers. Everyone has skills and talents they use to the fullest on this mission. Ours happen to be medical doctor for the mission and emergency plan creator. Since we are 50-70 miles from the nearest medical facilities, being able to triage a problem before it gets worse is a great way to serve. I diagnosed everything from infected Russian Olive tree thorns, severe positional vertigo, TMJ, chest pain requiring 3 cardiac stents, torn knee ligaments, corneal flash burns from welding, to a bad case of shingles. 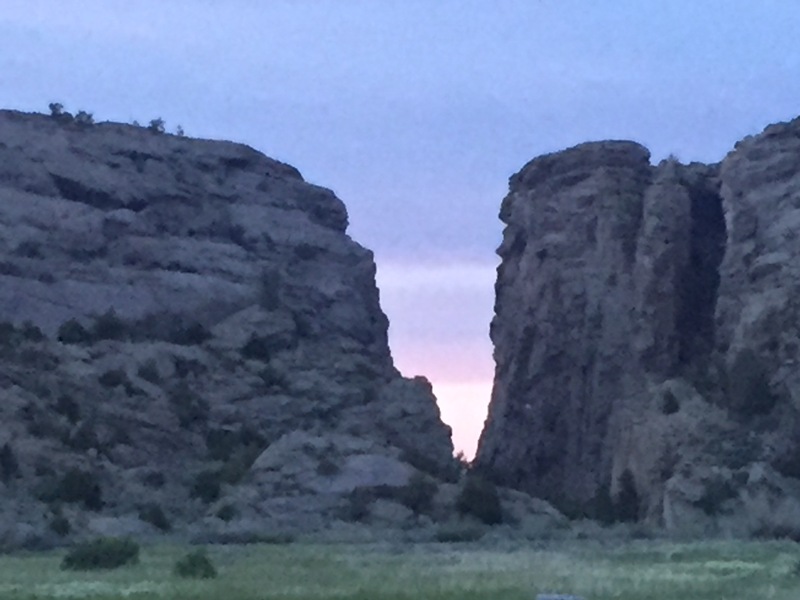 Six miles from the homestead, heading east on the highway to Casper, is Independence Rock, the pioneer register of the trail, where travelers carved their names on the granite monolith. We serve as volunteers for the State and tell people about the rock and encourage them to check out Martin’s Cove as well. We also get to climb the rock! Independence Rock partly got its name because if your pioneer group got there by Independence Day, July 4th, you were almost guaranteed to get across the Rocky Mountains before the snows came. The Martin Handcart Company arrived at Independence Rock around November 2, 1856 and had to trudge through deep snow and a fierce cold wind. As part of our volunteer hours, we pick up trash along the highway several times a year. There’s some interesting stuff out there, folks. Cleaning up the highway in front of Rattlesnake Pass- where all 500,000 pioneers traveling on the 4 historic trails came through on their way out west between 1843 and 1969. The missionary sisters dress in full pioneer outfits, complete with bonnets, aprons and bloomers, and take the Wyoming 4th grade school children on tours of the homestead ranch, visitor’s center and let them pull handcarts. It is a favorite field trip for the kids and we enjoy it too, as they are encouraged to call us ‘Grandma’. Many kids have gone home and insisted their entire families come back to see this place, sometimes that same afternoon. Stay tuned at this same bat time, same bat channel for more to come in Part Three! As our Wyoming Mormon Trail Mission winds down, we wanted to share with you some of the things we have packed into this 6 month experience. This is a very short mission compared to other senior missions that last 12, 18 or 23 months. But a lot happens in that short time. First and foremost, we have been called, set apart and ordained as missionaries of the Church of Jesus Christ of Latter-day Saints. Our purpose is to invite others to come unto Christ by helping them receive the restored gospel through faith in Jesus Christ and His Atonement, repentance, baptism, receiving the gift of the Holy Ghost, and enduring to the end. Martin’s Cove Mormon Handcart Historic Site encompasses the national historic landmark Tom Sun Ranch established in 1872, one of only a few western ranches to achieve this honor; Devil’s Gate, a natural cleft in the Rattlesnake Mountains where the Sweetwater River flows through; and the four pioneer trails – Oregon, California, Mormon and Pony Express that passed through this property. You can still see the original wagon tracks and depressions in the ground where the weight of the people, gear and animals crushed the earth. We give tours of the reconstructed Fort Seminoe, which was an abandoned trading post where the freight from the Hodgetts Wagon Company was stored over the winter of 1856 so the weak and sick Martin Company pioneers could use the wagons to ride to Salt Lake. Twenty men had to stay behind to guard the freight. They were on near starvation rations and ate animal hides to stay alive until they and the freight could be taken to Utah 7 months later. None of them got sick or died during that time. We also honor and protect Martin’s Cove, a ravine behind a large sand hill up against the bare granite mountains. The pioneers spent 5 nights in the Cove and as their people froze to death, the bodies were placed in snow banks because the earth was too hard to dig graves. Wild animals soon scattered the remains. We do not know where the bones are, so the entire area is hallowed ground. After having a brief spiritual talk by their leaders, trek groups walk reverently and quietly up into the Cove to contemplate the real meaning of sacrificing everything for what you believe in. The Visitor’s Center is located in the original family house of the Sun Ranch. We maintain some of the ranch buildings from the 1880’s. We show people the historic displays, telling them the stories of the Mormon pioneer handcart companies (meaning: people organized in a group to safely travel across country, not a company that builds handcarts). And most importantly, we offer our visitors a copy of the Book of Mormon and bear testimony of Jesus Christ. One of the best mission assignments is trek hosting– where we get to guide the groups of people that come to trek up into Martin’s Cove (5-8 miles) to re-connect with their spiritual roots. Church groups (youth 12-18, young adults, church congregations and families) dress in 1850’s pioneer style clothing, load up their hand carts and trek to the Cove and then on to their primitive campground. We help them feel the special spirit of the Cove and teach them pioneer stories of faith, obedience, sacrifice and charity. These young trekkers don’t have their cell phones or internet access, so they learn to talk, laugh and work together, square dance, play pioneer games, rough camp and bear testimony. There were 45,000 trekkers this year over the three historic mission sites. We have 60 missionary couples to do all the work and service necessary to give our visitors a great experience. To bring the lives of the Mormon pioneers to life, we tell stories from their journal entries. They are now our friends and we care deeply about them. We all participated in the Martin Handcart Story- a play with original music. I’m really glad I didn’t know until afterwards that Marie Osmond was on the front row (her sister-in-law is one of our missionaries). For one week, we had the privilege of serving at Rock Creek Hollow (100 miles from our main camp), where the Willie Handcart Company suffered tragedy during the 27 hours it took them to cross Rocky Ridge in October, 1856. That night, 13 people died and were buried in a common grave. An additional two men who buried those dead also died from exertion the next day. The common grave site is marked and there is a very special spirit there. One of my favorite times was sitting in front of the grave marker, researching the stories behind the names. James Kirkwood, age 11, was assigned to help his 4 year old brother Joseph over Rocky Ridge. His mother and older brother struggled with their handcart loaded down with their possessions and another crippled brother. James ended up carrying Joseph when his little feet were too frozen to walk. After he got to the camp at Rock Creek Hollow, James put his brother down and then died by the fire. Joseph lived and his descendants always honor the ultimate sacrifice of their Uncle James. It is a quiet, cold, isolated and windy place. We greeted any visitors who made their way to this remote site and served as campground hosts for numerous trek groups. To get to the Hollow, the first trekkers of the season spent 12 hours pulling handcarts 15 miles over Rocky Ridge (the highest point on the historic pioneer trail). They had been heavily rained and hailed on. At 7 pm that night, coming over the last hill into Rock Creek Hollow, they were covered with dried dirt from fording multiple streams, mud holes and a broken bridge, with sweat streaking through the grime on their smiling faces as they waved white handkerchiefs and sang in loud voices, the trek anthem, “The Fire of the Covenant”. I will always cherish our week at Rock Creek Hollow. And that is only some of the adventures. Stay tuned for Part Two! Between 1843 and 1869 (when the railroad finally joined the west coast to the rest of the nation), 500,000 people rode horses, walked beside their wagon or pulled a handcart by Devil’s Gate (in Wyoming) on their way to what is now Oregon, California and Utah. This summer we are camped right on this famous trail which we read about in our American Heritage classes as teenagers. Our mission this summer is to tell thousands of visitors the stories of these pioneers. The Martin Handcart company, made up of over 600 European immigrants bound for the Salt Lake Valley, got a late start on the trail in 1856. They were seeking refuge from religious persecution in their homelands. Because of their late start, and early snows in the high plains of Wyoming, over 150 of their group perished as they struggled to pull their carts through the snow and sub-zero temperatures. During the worst of these storms they took shelter for five days in a cove just west of Devil’s Gate, now known as Martin’s Cove. These are touching stories of sacrifice which families made in order that their children and future generations could be raised in a place that would nurture and promote their religious freedom. Many of our visitors come in groups of 30-700 teenagers. They set up in primitive camp sites, dress in 1850-era pioneer garb, pull handcarts and cross rivers: re-enacting to the best of their ability a small part of the journey their forebears made so that they can appreciate the heritage they enjoy as free people, and as members of the Church of Jesus Christ of Latter-day Saints (Mormons). During their experience with us, these youth cover mile upon mile pulling their handcarts, fording rivers and thinking about their relationship with God, about what they truly believe, and how they will, in their own way, be pioneers of the next generation. These are amazing youth! They get it. Wendy and I have been in awe of their dedication, their desire to learn and their pure goodness. They give us hope for the next generation. We feel so fortunate to be their mentors and guides. The most important things I choose to do in life, I do for free. When you do something with no expectation of compensation, it says something. It says you are sincere. You may be misinformed or mistaken, but you are definitely sincere. I have taken countless people flying, for free. Why? To share the joy of flight with them. To see the wonder and thrill of it in their eyes. Check out this video of an adorable 4-year old getting her first airplane ride. This is what I’m talking about! Although I was a Registered Investment Advisor (RIA) for many years and managed retirement portfolios, I much prefer using my experience and knowledge now to teach people to manage their own investments. Imagining my friends becoming financially independent is reward enough. I love investing. And I so enjoy teaching those few souls who can catch the vision, and have the courage and clear thinking to take control of their own financial destiny. Wendy and I have had a habit, our entire lives, of volunteering at church. And we love it! I have had so many amazing adventures as a scout leader, a public speaker, a teacher, and a leader through these volunteer church assignments. I’m convinced that I get far more out of these experiences than those I’m supposed to be helping. I learn, I grow, and I feel satisfaction. As Wendy and I looked at our schedule for 2016, we saw a great opportunity to volunteer this year. So we went through the process (with the help of Bishop Jon Allen of the South Mountain Ward, and President Porter of the Phoenix Arizona Stake of our church) of applying to be senior missionaries for the Church of Jesus of Latter-day Saints. And Monday, January 18, we received a formal letter from President Thomas S. Monson, the President of our church, inviting us to serve for six months, beginning May 2, 2016. He has assigned us to serve in the Wyoming Mormon Trail Mission. What will we be doing? Helping people understand and appreciate what it was like to walk with their families, pulling all their earthly belongings in a hand cart, 1300 miles from Illinois and Iowa to join other members of their faith in the desert of the Utah Territory during the years 1847-1868. I love this history and am fascinated by what motivated these ordinary people to do such extraordinary things. There are several historical sites where guests are led on treks, pulling hand carts to reenact and experience for themselves what the journey was like. And there is also a visitor’s center where missionaries can tell the stories and show video reenactments. So that’s where we will be from May through October of this year. Again, the most important things I do, I do for free. And I’m looking forward to honoring these pioneers who helped build the character of our nation. Freedom of religion and the desire to be with others of the same faith was so important to them, they gave up their homes and jobs, sold all that they had to pay for ship’s passage from numerous countries in Europe, to come to America. Then they took ferries and trains to what was at that time, the western edge of the United States, in Iowa. And from there they walked with their children to over 1,000 miles to the Salt Lake Valley. I expect to learn a lot from these pioneers as I dig into this part of our nation’s history. More details to come once we get there and get our assignments. It’s going to be a fun and meaningful year.